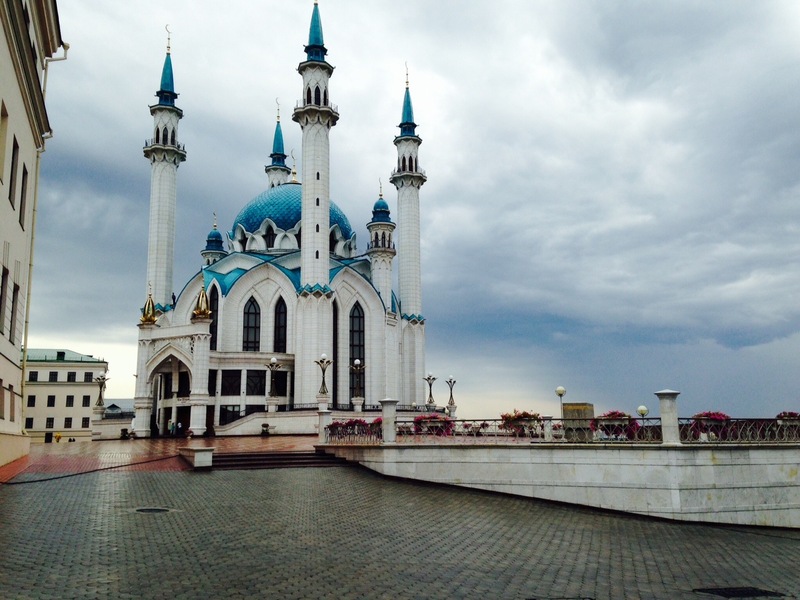 On the Golden Eagle across Siberia (Part III) – From Tatars to Lenin. From the train windows we note the silver birch trees everywhere, a constant presence in the Russian landscape (and in our imagination,from “War and Peace”to “Doctor Zhivago”). In Soviet times, this national tree of Russia gave its name “Beriozhka” (little birch) to all state souvenir stores. We are told that it stands as a symbol of the Russian Girl. The trees, quite fire resistant, are still used in housebuilding and in many other ways, from acoustic guitar material to twigs in the sauna. The bark has antiseptic properties, it helps make diuretic tea and is even used for making shoes. By the time we reach Vladivostok one fellow traveller, John, remarked that he had seen quite enough birch trees for a lifetime! Having travelled overnight we reach Kazan, or the Quazan of the Mongol-tribe Tatars, our first major stop since leaving Moscow. Here we also cross the mighty Volga river, the “Mother Volga” of Russian lore, the longest and largest river of Europe, on its long journey to the Caspian Sea. The Tatar language is official. Never write or say the word “TaRtar” warns our guide as it means “from Hell”. In Tatar, the word Siberia means “sleeping land”. Our first visit is to the imposing new (2005) mosque, but the first impression is BOOM TOWN! New buildings are everywhere. “They are spending like there is no tomorrow” observes Dan our Oxford Prof “and the reason is oil “the black gold”, mostly extracted by the Tatarnaft company. There are new apartments all over the city, the first 30,000 given away FREE! 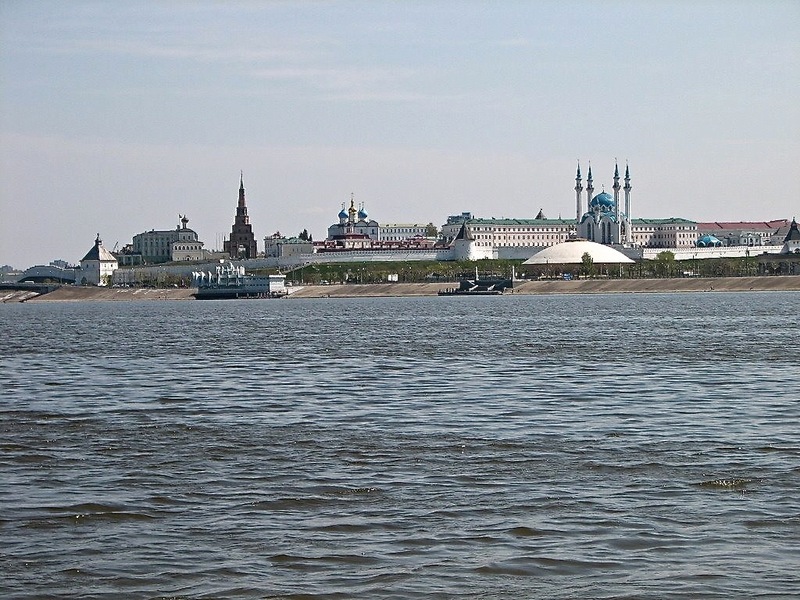 Oil has made Kazan one of the largest industrial and financial centres in Russia. Oil money has produced that spectacular new mosque. There are also old mosques from the days when Catherine the Great, still remembered fondly because of it, permitted religious tolerance. There is also a new Orthodox cathedral. In the afternoon we are able to visit the ancient and renowned Kazan University.Former scholars include the brilliant mathematicians who could calculate that two parallel lines would eventually meet (yes,in outer space!). A famous wind tunnel of the physics department made use of the former cathedral building closed down during Soviet times. Equally interesting are the academic “failures”, among them Lev Tolstoy considered “both unable and unwilling to learn” and the young, revolutionary Lenin expelled in 1877 for “student disturbances”. He remains a significant and polarising figure throughout the former Soviet regions (in February, on one day alone, some 90 Lenin statues were toppled in the Ukraine). We anticipate seeing the largest Lenin memorial, a huge head almost 8 mts (25 ft) tall, at Ulan Ude, an important stop towards the end of our journey. Here at Kazan University we see a unique flowing-hair Lenin presenting an inspiring image. 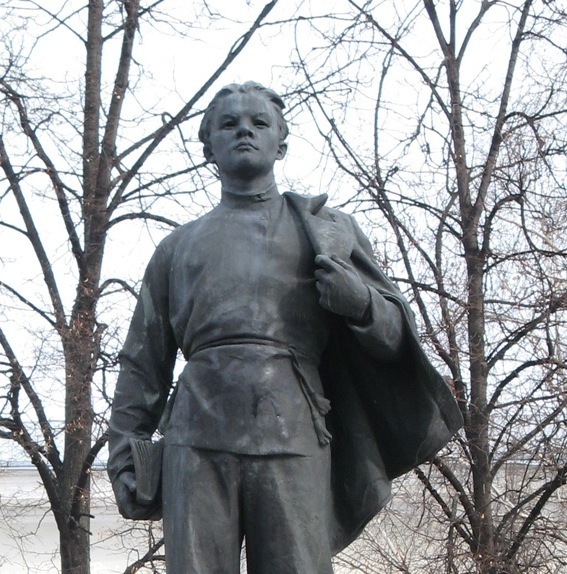 We all instantly rename it the Leonardo di Caprio Lenin as it bears an uncanny resemblance to the Hollywood actor. But our train awaits, so on towards the Ural mountains, the division between Europe and Asia, another overnight journey. There is still time for a film on the last Czar of Russia, some briefings on the next day’s Yekaterinburg visits, vodka and caviar in the restaurant, piano music in the comfortable lounge bar. Alain is a long term resident of the Provence and passionate follower of Napoleonic campaign reenactments. Battlefield re-enactments add a different dimension to memorials. They bring out the full spectacle, the identifying colored uniforms,the regimental flags and the moving patterns of what was a chess game of life and death. They are a glimpse into the past, an attempt to understand historical experience in a way that will frequently elude the armchair campaigner writing detailed footnotes. It is possible to claim that no landscape feels as haunted as the scene of a battle. Otto von Bismarck expressed that clearly, “The great questions of the day will not be settled by means of speeches and majority decisions, but by iron and blood “. Over many years, Alain has walked over battlefields, from Waterloo to Austerlitz and on to the grim field of Borodino on the road to Moscow. Lev Tolstoy, writing in “War and Peace”, saw it all as being “…opposed to human reason” and thought that “in historical events, great men-so-called-are but labels serving to give a name to the event.” Napoleon himself claimed that “soldiers generally win battles; generals get the credit for them”, and yet, for more than a century, military theory and practice was constantly measured against the genius, and myth, of one man, Napoleon Bonaparte, who knew very well that, not being a genuine monarch, he could never afford defeat. We asked Alain a number of leading questions about his fascinating interest. LGQ : How long have you been going to Re-enactments ? First time was in 2001……. I had read many books on the subject but had never been to any of the battlefields. We travelled by coach from Épinal in the Vosges all the way to Moscow and back, following in the footsteps of Napoleon’s Grande Armée. Of course, going to Russia added to the spirit of adventure. What made quite an impression on me, was visiting the site of the Berezina river crossing in what is today Belarus. Nothing has really changed there since 1812 ! The houses in Studzienka (the village where the two bridges over the Berezina were built) most likely look much the same as they did in 1812 …(thanks to communism) still entirely built of wood. The fields and forests are still there…no industry, no modern buildings. One can virtually believe that Napoleon and what was left of his army saw the same landscape. The word “ Bérézina “ has in french become synonymous with disaster. The battle of the Berezina took place on 26-29 november 1812. In itself the battle was a victory for the French as they managed to cross the river over the two bridges built on the orders of General Eblé and his 400 mostly Dutch bridge engineers. For the Russians it was a military defeat as about 50.000 French soldiers crossed safely to the right bank of the river. However…after the crossing of the Berezina one could say that the “ Grande Armée” did not exist anymore. In the next few days the temperature dropped to – 20/30 celsius. The next tipping point for me was the bicentennial of the battle of Austerlitz in 2005 , near the Czech city of Brno.There I realized the importance of the 100 and the 200-year commemorations. More participants, more money is made available to organize such an event . There is much more adrenaline ….it is like drinking champagne instead of wine ! LGQ: What got you involved ? LGQ: What preparations do you have to make? LGQ : Which battles have you attended? 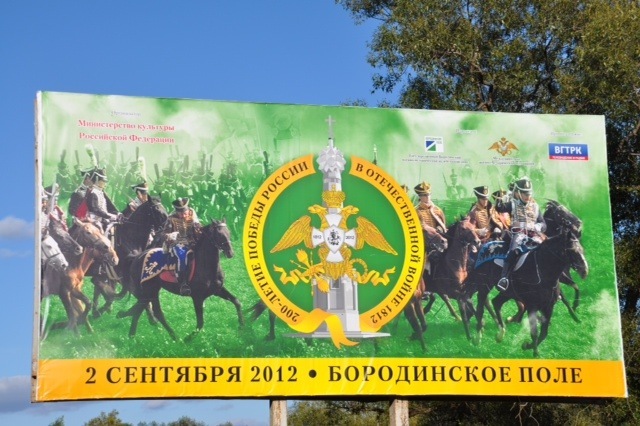 The first re-enactment I saw was of Borodino in 2001 (in Russia about 100 km from Moscow). I was with a group of French people, all passionate followers of Napoleonic history. That year I also visited the battlefields of Austerlitz and of course the Crossing of the Berezina. The next re-enactment was in December 2005 . It was the bicentennial of the battle of Austerlitz, still remembered today as Napoleon’s greatest victory. It was also the battle of which he was most proud ( he defeated the combined forces of the Russians/Austrians and the Prussians ). This is a battle which is still studied today in Military Academies all over the Globe. Napoleon had observed during the previous days of the battle that the morning mist regularly filled the lowland and was then slowly burnt off by the winter sun .He used that mist to disguise his troops and make a surprise attack on the Pratzen plateau. The Russians who held the Pratzen plateau were routed and it was a turning point in that day’s battle as Napoleon had split the enemy line. On the 5th of December 2005…..the fields were covered with a thin layer of snow….it was freezing and the mist was there as well as the sun . It was perfect ! LGQ : What do you feel you get out of it ? Going back into the past. History.The closest I can come to how it really happened. LGQ: Why do people participate in re-enactments ? In Borodino, participants in the re-enactment also recreated for themselves the encampments near the battlefields with tents identical to those used in 1812, open wood fires for keeping warm and for preparing the food. In December 2005 at Austerlitz, people camped outside, near the battleground in freezing cold weather….. In the real invasion of Russia there were 30.000 dead on Napoleon’s side and 60.000 on the Russian side at Borodino alone. About 650.000 men from various nations set out with the Grande Armée and took with them 28 million bottles of wine . LGQ: Which future events are you preparing for? These events have caught the imagination of literally thousands of men and women across the globe. 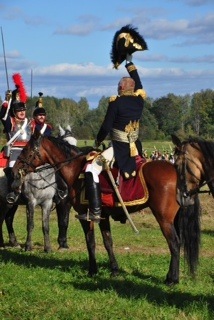 At the last Borodino reenactment there were over 100.000 spectators. Napoleon is usually played by either Frank Samson of France or Mark Schneider of the United States of America. The role of Napoleon at Waterloo 2015 has not been attributed yet but will be given to either one of these two men….A fierce competition is going on between the two for this prestigious role. 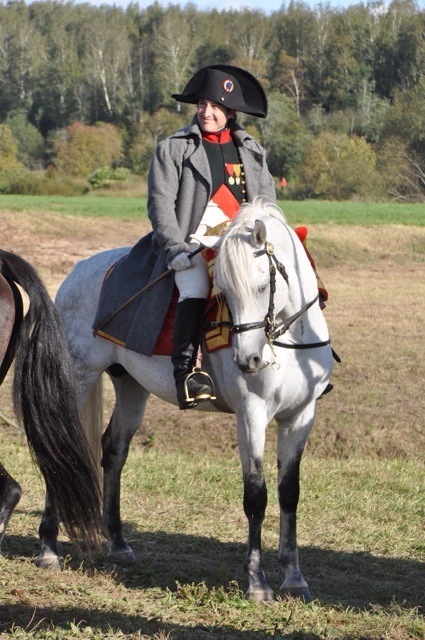 At the major re-enactments of Austerlitz 2005 and Borodino 2012, Napoleon was played by Mark Schneider ,an actor from Virginia who looks a bit like Napoleon, he is an excellent horse rider who has earned the reputation of playing the role vigorously. Frank Samson is a lawyer who has studied Napoleon’s native tongue. He, of course, is a bit dismissive of the American, a Napoleon played by an Anglo-Saxon , Quel horror ! ( please note that the role of Wellington is presently played by a New Zealander !?) The organizing committee of Waterloo 2015 face a difficult task taking a decision. Albeit…in the late 1980’s, six Napoleons turned up at a reenactment event at Waterloo!